The CO2 kit includes basic equipments of CO2 supply for 60cm standard size aquarium. It contains all the necessary parts, such as a 95 g CO2 cartridge mit, a pressure regulator, a 3-in-1 diffuser, a holder for the CO2 cartridge and some tubing. 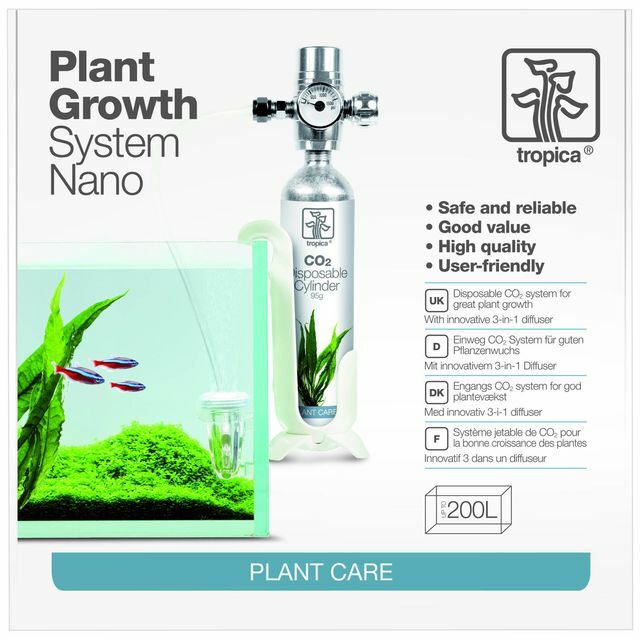 It is suitable for a CO2 supply beginner. The CO2 cartridges are available separately, too. Aquatic plants originating from the Danish aquatic plant nursery Tropica differ from those from other nurseries by their excellent quality. Extremely high standards and a very varied range of plants make setting up an aquarium or aquascape a very pleasant experience. Healthy water plants are an essential basis for an aquarium that's practically free from algae. Tropica's well-planned product range is constantly enriched with new innovative aquatic plants. For aquascapers and aquatic plant enthusiasts, plants by Tropica are always a great choice. My first CO2 system and what a great way to start. Item came on time with everything. Had a look at the video and followed all directions and within 5 minutes I was up and running. Not sure how long the canister lasts and if it's possible to get bigger ones but all in all a great buy and highly recommended. Dieser Co2 Anlage erfüllt einfach Ihren Zweck. Im Vergleich habe ich das ADA Co2 System, welches außer beim Preis und der Zufuhr den einzigen Unterschied hat. Die Flaschen kann man super ans Becken hängen und sehen gut aus. Die Aquarium Kombi dazu ist ein Azoo Flexi Mini Set - zu dem Preis bei der Beckengröße absolut empfehlenswert. Nachschub gibt's auch überall.